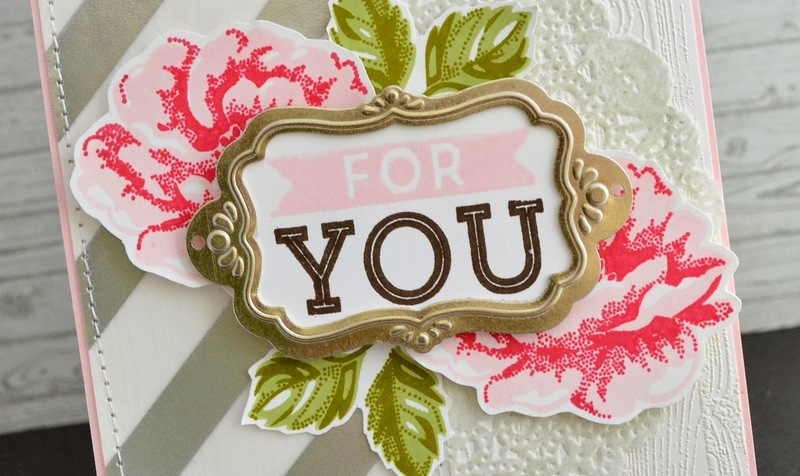 To create my card I used my "go to" Stampin' Up! floral set - Stippled Blossoms. I stamped the blooms using Pink Pirouette, and Strawberry Slush ink. 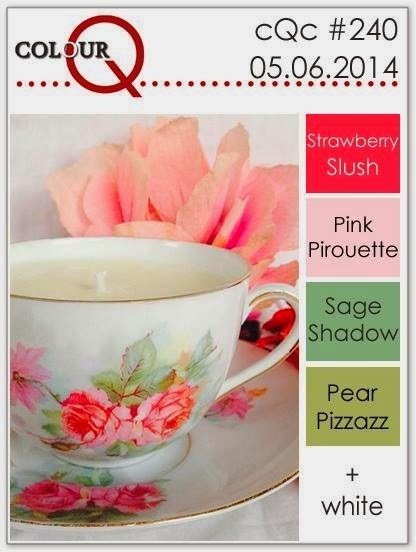 The leaves were stamped using Pear Pizzazz and Old Olive. (I don't have any Sage Shadow ink!) Now, the color medium I do have of Sage Shadow is a set of SU chalks from 10 years ago. So, it is difficult to tell from the picture but, the doily on my card was colored using Sag Shadow chalk, and a foam makeup sponge! I knew it was a good idea to hold onto my chalks! The sentiment is from the April SU Paper Pumpkin kit. Using white embossing powder and the SU Hardwood background stamp I heat embossed my wood grain background to add a subtle touch of texture. I also added a bit of machine stitching on my silver striped vellum. Speaking of stitching I am also adding this card to the current Virginia's View Challenge which features, you guessed it, stitching! I totally love this card, and I hope you do to! Thank you for stopping by! Gorgeous! Great take on the challenge! Lovely card, Veronica! Thanks for joining in the fun at the colourQ. I LOVE how you pull all the elements together and stitched it with LOVE! Your talent and skills totally show through in this design! What can I say? You rock! Thanks so much for playing Virginia's View challenge! So pretty - love the stippled blooms and the colours look great with the silver! Thanks for playing along at Colour Q Veronica! Absolutely LOVE it! The colors are gorgeous! This is very pretty! I love the silver stripe! This is lovely!! The colors are so soft and pretty. 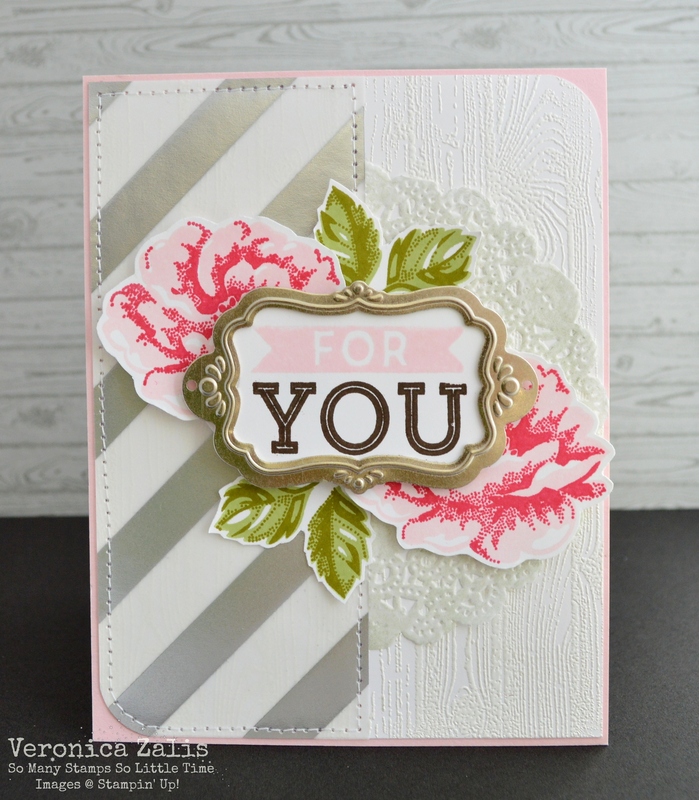 I love the texture of this card with the embossing, stitching and the doily. Beautiful design! !